Cult of the Mouse: Can We Stop Corporate Greed From Killing Innovation in America? Cult of the Mouse: Can We Stop Corporate Greed From Killing Innovation in America? Meet Disney'¬'s most recently inducted, eighth dwarf, GREEDY. In corporate America, innovation is being crippled by a blatant focus on short-term profits-the incessant need to "maximize share-holder equity." Disney, a company known worldwide for its innovation and creativity, has become an example of this insular thinking. In CULT OF THE MOUSE, ex-Disneyland director of creative services and successful entrepreneur Henry M. Caroselli uses this once-ingenious company as a framework for a timely, compelling discussion of why America'¬'s greatness is in jeopardy and what needs to be fixed to restore our ability to do what we do best, generate paradigm-changing ideas. Drawing upon fascinating historical references not only of Walt Disney, but also of other great innovators, Caroselli provides sage advice for growing a company by giving creativity a boost. Part expos? (c), part how-to, this intriguing, practical business book shows how bad things can happen to even the greatest of companies-giving businesses large and small a much-needed, swift kick in the pants. A business book supporting innovation and creativity that uses Disney as a cautionary tale. Henry M. Caroselli worked as creative director at Disney for six years. Useful for anyone struggling to make something of consequence in the corporate rat race, starting up a business, or trying to expand their established business; insightful for Disney stockholders and fanatics. Disney continually makes national headlines over movie deals, threats of corporate takeover, and controversial CEOs. Another challenge to corporate America from the publisher of HOW WAL-MART IS DESTROYING AMERICA (AND THE WORLD). 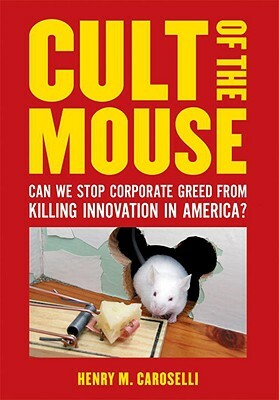 Title: Cult of the Mouse: Can We Stop Corporate Greed From Killing Innovation in America? Author Name: Caroselli, Henry M.
Description: 190 pp. Nearly new, no markings. With publisher's promotional material laid in. An ex-Disney exec uses his former employer to illustrate how many U.S. corporations are stifling creativity in the name of serving shareholders. Keywords: BUSINESS. CORPORATIONS. PROFIT. PROFIT MOTIVE. DISNEY. CREATIVITY.